DL Light is top quality outdoor led flood lights & led street lights & tubelight & led high bay manufacturer & supplier. DL Light is top quality led flood light, Led street light, led high bay, tubelight and led bulb manufacturer & exporter from China. DL Light is subsidiary of DL Industry Group Ltd.. Based on the 30 years’ experience of mother company, DL Light has become a manufacturer and supplier of all kinds high quality Led lights including Outdoor Led flood lights, Led street lights, Led High Bay, Explosion-proof light, Tubelight, Led corn bulb for domestic and international market. Currently DL Light has one sales and service office in Tianjin and two joint venture factories in Shenzhen and Zhongshan. Establish long term close cooperation relationship with global famous raw material suppliers including Epistar, Cree, Philips, Meanwell, Moso, etc. DL Light has been adhering to the concept of “Quality and Service Light the World”, persists in independent innovation, continually provides energy saving and eco friend lighting solutions and high quality lights, towards becoming a world-class lighting manufacturer. 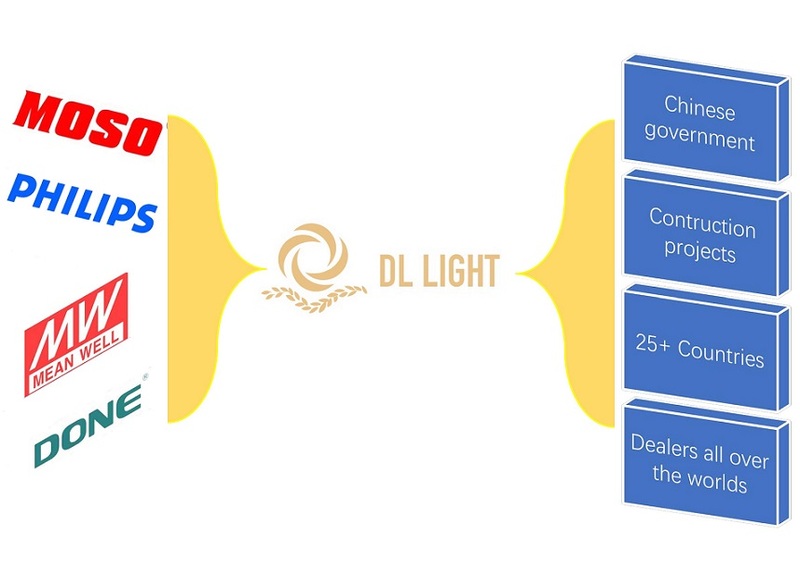 DL Light is manufacturer of Led lights including Outdoor led flood lights, Led Street Lights, Led High Bay, Explosion-proof light, Tubelight, Led corn bulb. DL Light has two factories in Shenzhen and Zhongshan. Both factory can produce more than 1000 models all kinds of Led lights. DL Light factory is produce flood lights. In 2017, DL Led light’s unique design outdoor led flood lights and led street lights launched, the light has the luminous efficacy of more than 150lm/w which is higher than Philips, meanwhile provide 5 years warranty time. 1. Design and produce new street lights, flood lights, led high bay, tubelight, etc. 3. Customize & produce the lights as requirement. 4. Advance & After sales service.